What happens when the one who specified the worlds most famous equation( e=mc2) participate in a rap battle against the smartest man alive, whose theoretical prediction that black holes emit radiation is often called hawking radiation. You are right, we are talking about two great scientists Albert Einstein and Stephen hawking. Epic rap battle channel has created this video , with lookalikes of both Einstein and Hawking. Let's see who wins? comment below who do you think wins ? 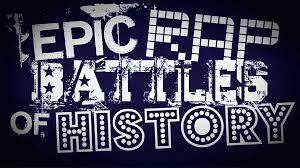 subscribe to my blog to get updates of new rap battle and don't forget to share guys.